I had absolutely no input into this one. The first time I knew anything about how my cover would look was when my publisher sent me the finished design. 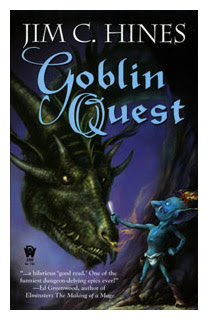 This was actually the second Goblin Quest cover. The book was first published by a smaller press before being picked up by DAW. I had some input into the small press cover (which is online at http://www.sff.net/people/jchines/Covers/GoblinQuest%20-%20Full.jpg ). That one came out pretty dark. I think the DAW cover works much better. This is one case where it was better to keep the author out of it and let the professionals work. The DAW cover really captures the fun tone of the book, even though there's no way my goblin would ever get that close to a dragon. He's much more the "Run away and let someone else get toasted" type. I'm very happy. As the author, I'm a complete control freak, so there are always details to nitpick about. The skin tone is a bit brighter than I like, and technically, that scene never appears in the book ... but it's a good cover. It conveys the tone of the book, and I've had a number of people tell me the cover led them to pick up and buy the book. That's exactly what a cover is supposed to do. And Mel does a marvelous job of getting the details right, from the torn seam in Jig's boot to the color of his spectacles on the cover of the sequel. I would probably change Jig's loincloth. It looks a bit too diaperlike to me. Probably Smudge, Jig's pet fire-spider. It doesn't come through as well on the book cover, unfortunately. But I've got a larger print of the artwork, and Mel actually managed to make that little spider cute. I'm a bit arachnaphobic, but he really captures Smudge as a lovable little pet. The difference between the current cover and the former cover is very great. The former cover implies a dark and probable gruesome tale that would probably star Sigourney Weaver when the movie came out. The new cover leads us to believe the story is, well, safer and lighter. It's hard not to smile when looking at this cover! Best of luck with the DAW release.